It is time for Day Two of 10 Books a Day! Today’s topic. Nerdy Teacher Books. Being a teacher is not just my job, it is my calling. As a child, if you came to my house, we played school. I have had teachers over the years who have inspired me and those who have challenged me. I hope I am a little bit of both. One thing I know for sure is that I model life-long learning for my kids. I’m always carrying around some kind of book that guides me as a teacher or teacher-leader. 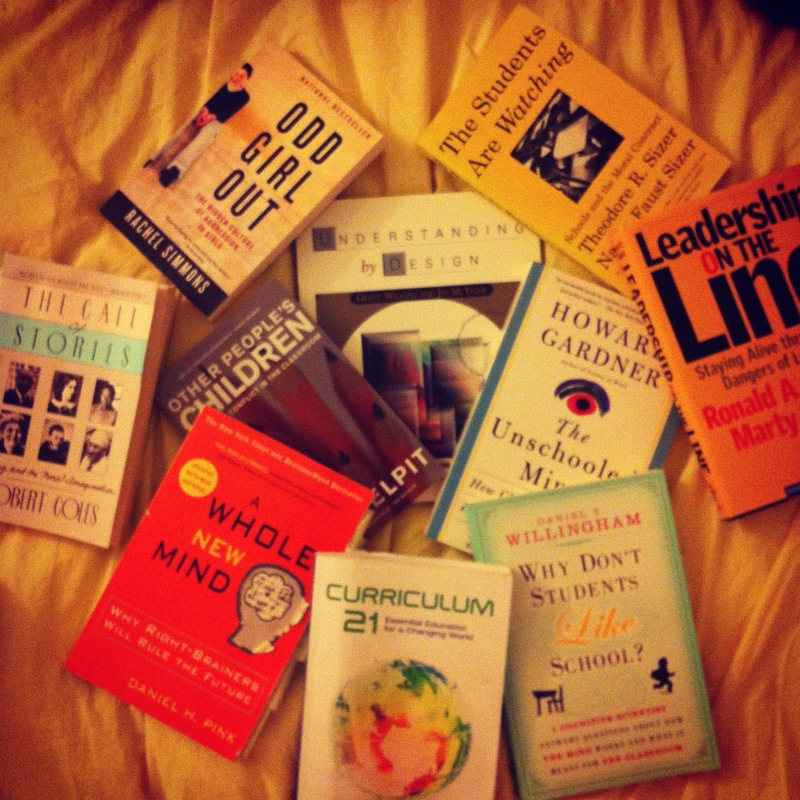 I have a MILLION books (some from ed school, some picked up along the way) but here is a small sampling of my favorites. The Call of Stories by Robert Coles. A collection of stories that encourage us to to listen to others and to continually self-reflect. We read one of the stories in our work at the Klingenstein Summer Institute 2008. A Whole New Mind by Daniel Pink. The right-brainers have been in the corner long enough. In his seminal work, Daniel Pink argues that right-brained thinkers will shape the future and we must nurture empathy and creativity for success. Good discussion guide for you and your colleagues. Curriculum 21 ed. Heidi Hayes Jacobs. I may quite possible be obsessed with this book right now. I haven’t even finished it yet (it is my summer reading of choice) and I’m overwhelmed by the brillance of it. It is my new manifesto. A call to “arms” for a complete re-think of how we do school in 2012 and beyond. I recommend it for anyone who is tired of “old skool” and encourage school leaders to share it with their staffs. Start a Revolution! Why Don’t Students Like School by Daniel Willingham. An interesting, cognitive-science based look at why students don’t engage in school. This is just one perspective that is jam-packed with scientific analysis. It is a heavy read and not something I would call “inspiring” but for your teacher who wants data, this is it. Leadership on the Line by Heifetz and Linsky. Not an education book per say, but my favorite book from my master’s program in school leadership. Personal (sometimes a bit too much, Marty Linsky in the bath tub, ew!) and thoughtful, it allows the reader to create mental models of what leadership can look like when you get “on the balcony” and get the whole picture. Highly recommended for leaders facing a crisis or those who want pre-emptive strategies. Other People’s Children by Lisa Delpit. How do our assumptions and stereotypes impact our work in the classroom? How does our educational policy structure perpetuate low achievement and discrimination? Dr. Delpit explores it all in her best work. She explores the stories of teachers and the negative impact they can have when working with students of color. Odd Girl Out by Rachel Simmons. Like Queen Bees and Wannabes orReviving Ophelia, Rachel Simmons explores Girl World and the aggressive culture that exists, particularly in adolescence that can be terribly crippling. The word “bullying” has become a catch-all term for some developmental skirmishes children encounter but true bullying can leave lasting scars and it cannot be accepted, ever. The Students are Watching by the Sizers. We are not merely responsible for the 3 R’s anymore. We are integral parts in the moral development of children. Anyone who doesn’t think this should walk away from the classroom, right now. We shape character more than we teach math, English, music, or history. This is truly the purpose of school. Understanding by Design by Wiggins and McTighe. UbD has exploded since its inception as a major framework of teaching and learning. I don’t follow all of the pieces of the framework and have not used it regularly but I concur with one major point. We must know “where we are going” in order to get there. We must plan with the end in mind and we must engage the children in this process so THEY know where they are going and WHY. I could go on and on and on…..particularly if I created sub-categories and such but for now…I shall stop. Happy Reading. Next Post A new year-thinking without assumption.